Castle Comfort Stairlifts offers top brand stairlifts, keen prices and fast installs for all those seeking stairlifts in Peterborough, Camridgeshire. There’s been a settlement where Peterborough in Cambridgeshire is since the Bronze Age. Castle Comfort Stair Lifts haven’t been around quite that long but they are busy helping the folk of Peterborough who need help and advice about stairlifts! 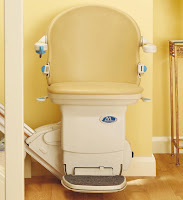 So if you’re looking for a stairlift or have a loved one who is, we’re the people to contact. We know all there is to know about stairlifts having been in the business for about 15 years and being agents for all British manufactured ones. You can see our stairlift prices and comparisons on our website. We can tell you everything you need to know and advise on the best type for you and your home. Please give us a call on 01604 269919 . We know Peterborough was already inhabited long ago because of an archaeological dig just east of the city known as Flag Fen. The oldest wheel found in Britain was at this dig. The site not only shows evidence of a Bronze Age settlement but also of Roman occupation. And when the Anglo-Saxons arrived they built a monastery later to become Peterborough Cathedral. So Peterborough like many places in Britain has a long history of people leaving their mark. Flag Fen is one of the best Bronze Age sites in Europe. At this park – 20 acres in total – you can see how people lived 4,000 years ago, see the collection of ancient tools, woodwork and jewellery as well as a collection of Bronze Age swords. In more recent times despite the age of Peterborough in 1967 it was designated as a New Town. This was the third wave of towns that already existed being given this title in an attempt to disperse growing populations to these areas especially from London. This development included the development of four new townships around Peterborough – Bretton, Orton, Paston/Werrington and Castor which was never built and remains a small rural idyll. Peterborough sits just west of the Fens on the River Nene. Much of this local area sits below sea level and typically you can see for miles over the flat landscape. The Cathedral’s ‘real’ name is Cathedral Church of St Peter, St Paul and St Andrew and it is also known as St Peter’s Cathedral! Statues of these three apostles and saints look down from the gables on the famous Gothic West Front of the building. The architecture of the Cathedral is mainly Norman as it was rebuilt in the 12th century after a fire. Along with Durham and Ely Cathedral it is one of the three most important Cathedrals of the 12th century. The Cathedral housed a number of symbolic relics including swaddling cloth from the baby Jesus and pieces of his manger, part of the 5 loaves which fed the 5,000, part of St Mary’s garment, a piece of Aaron’s rod and relics said to belong to the three apostles to whom the Cathedral is dedicated. It also housed relics of Thomas Becket brought from Canterbury. These certainly gave Peterborough Cathedral its status and wealth at the time. Needless to say all the relics were lost during Henry VIII’s dissolution of the Monasteries. Burghley House: The Grade I listed Burghley House is just to the north of Peterborough. This country house is a great example of Elizabethan architecture and a park that was designed and laid out by Capability Brown who also created the man-made lake there. Burghley House has featured in many films. It ‘appeared’ in The Da Vinci Code (Tom Hanks, Ian McKellen), Pride & Prejudice (Keira Knightley), Elizabeth: The Golden Age starring Cate Blanchett. Now Burghley is probably best known as the home of the Burghley Horse Trials sponsored by Land Rover. This is one of six most important three day events of the year, Badminton Horse Trials being one of the others. The prize for first place currently stands at £50,000 and prize money is awarded all the way down to 20th place. Elton Hall: a 17th century Hall in a mixture of styles is just outside Peterborough. There’s a 15th century tower and chapel built during Henry VII’s reign in the garden and a new west wing was added in the 17th century. The room interiors are as they were originally - interestingly opulent. The library still holds books from the original owner Sir Thomas Proby. King Henry VIII’s prayer book is also here. There’s a restored Rose garden, a knot and a sunken garden to explore too. In a more modern vein there’s a garden centre and a Loch Fine Restaurant on site too! Clare Cottage: And now for something completely different! Clare Cottage was the home of 19th century poet John Clare. 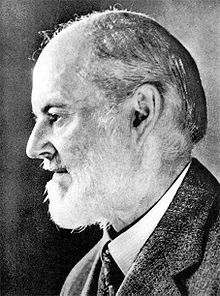 He worked in the area as an agricultural worker, a pot boy in the local Inn next door to the cottage and in the gardens of Burghley House. His first volume of poems were published in 1820. The cottage is simple and shows how rural people would have lived at the time. There are some examples of Clare’s work on show and information about his life. The cottage is owned by the John Clare Trust. Whether you’re heritage is posh or simple, Castle Comfort Stair Lifts can help you regain – or retain – your independence with a stairlift. Not being able to move up and down the stairs without difficulty is frustrating but we can supply straight, curved, perch and even reconditioned stairlifts to keep you moving. We can come and assess your staircase and advise you of the best one for you. We can install straight stairlifts in approximately an hour! So no sooner said than done. Curved stairlifts usually take about half a day but then you have an all singing all dancing means of transport up and down your stairs. If this sounds like a plan, please get in touch with us on 01604 269919 . ... aka Peterborough United Football Club was formed in 1934. This is where a number of well-known footballers started their careers such as Stoke City midfielder, Matthew Etherington and Simon Davis. They transferred to Tottenham Hotspurs together. David Seaman, England’s ex-goalkeeper began to get recognised whilst at Peterborough. Did you know that just under 1,000 of the 33,500 retired people in Peterborough already own a stairlift? Are you going to join them by getting a stairlift for your home? So that’s almost a 1,000 people in Peterborough who are at less risk of hurting themselves or having an accident on the stairs. If you think a stairlift would assist you, watch the video at the top of this page and give us a call. 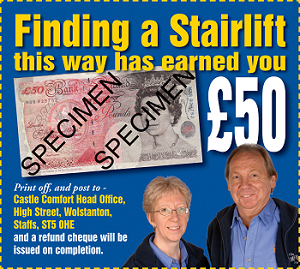 Remember you can use the £50 voucher towards your stairlift or look at 0% finance or grants to help with the costs. Just call us on 01604 269919 .